Japanese tea house, Chashitsu in Japanese, is where chado, the tea ceremony takes place, which expresses Japanese sentimentality and aesthetics through the act of drinking tea. It is a rare place you can reflect yourself, feel the connection with nature and others all at the same time. The tea once was consumed in the manner of medicine due to the stimulating effects of caffeine in Japan. After Zen monks brought tea cultivation from China to Japan during the Kamakura period (1185-1333), the tradition of tea drinking spread to the samurai as well. (Japanese feudal lord), samurai, and merchants who practiced the tea ceremony. They sought simplicity and tranquility which is the central tenets of Zen philosophy. So materials were limited to simple and rustic ones in the past. Tea ceremony evolved steeped in Japanese sensibilities concerning nature and tea houses are spaces that reflect such sentiments. Today, many practice tea ceremony and enjoy its benefit in numerous types of tea rooms from traditional ones to innovative ones. Japanese tea house, Chashitsu in Japanese, is truly the product of all of the traditional Japanese crafts combined and sophisticated. While the style is traditionally simple, uses subdued colors, to build a tea house or tea room, one must enlist the help of a wide variety of highly skilled workers. The list can start with a carpenter, a thatcher, a plasterer, a fittings craftsman, a tatami maker, and a gardener. 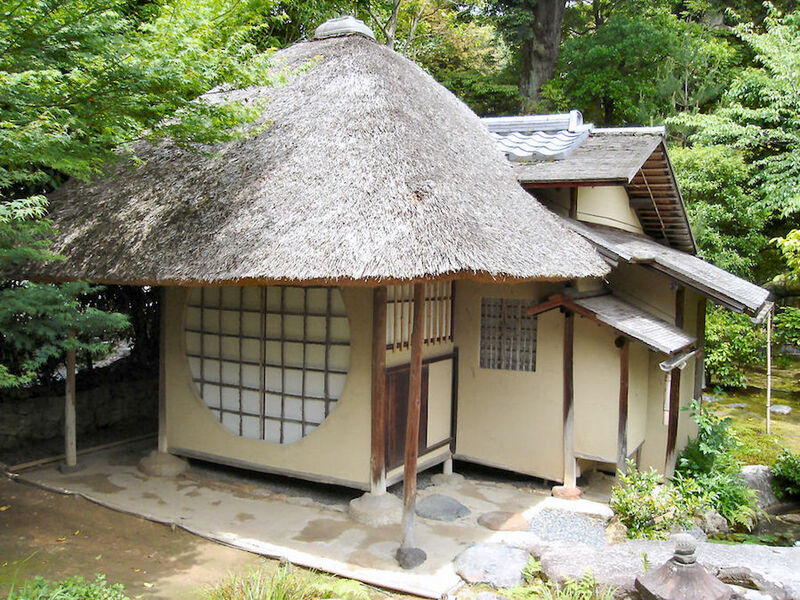 The structure of the Japanese tea house usually consists of two rooms: one is the mizuya where the host prepares food and snacks and tea supplies are stored, and the other is the main room where tea is served. 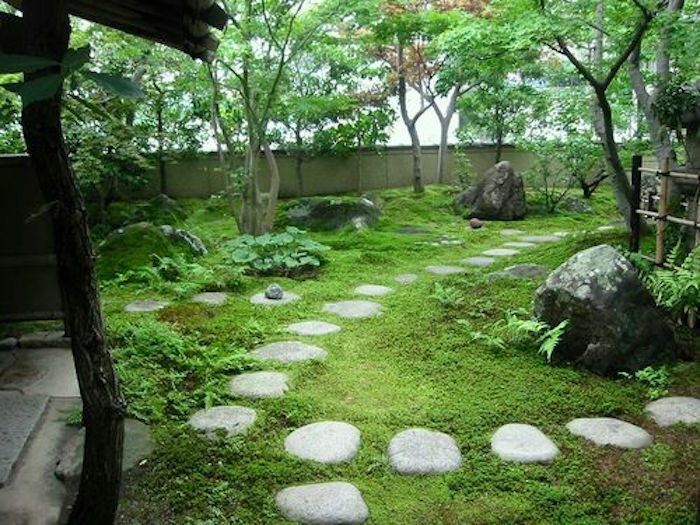 In front of the traditional tea house is a garden referred to as the roji – dewy ground. Once you step in the garden, you can expect this is going to be something which you can’t experience in the mundane world. Guests traverse it on a path of stepping stones admiring the plants and trees. Before entering the tea house building, they are supposed to wash their hands at a stone basin as preparation. 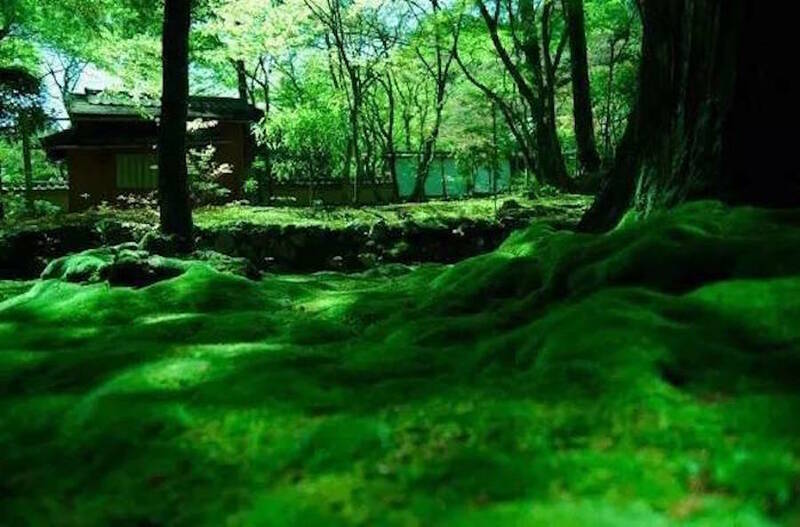 To enter the tea house, one has to crawl through a low and small entrance way which is called “Nijiri-guchi” regardless of rank, which makes everyone in the house equal. As the small entryway would force even a great general to leave his sword at the door to pass through, space inside becomes detached from everyday world where there is the distance in classes. It’s designed to make one to discard its title or position but to be pure as when one was born. So the tea house often described as the inside of the womb as an analogy. You may recall the Shinto torii gate and shrines as visitors are supposed to wash their hands and clean their mouth at the water basin and walk through a gate. The resemblance is clear, all the settings tell this is not a worldly place, but something out of the world. So that one has to clean himself before entering there, which can be seen in Shinto beliefs. The ultimate architecture which expresses the spiritual world are the Japanese tea houses. In Japan, building architecture always has taken consideration of human behavior, buildings are containers while Module, the human measure was adopted in the western world only in the modern times. The standard size for a traditional Japanese tea house is 8.2 square meters, which is four and a half tatami mats. 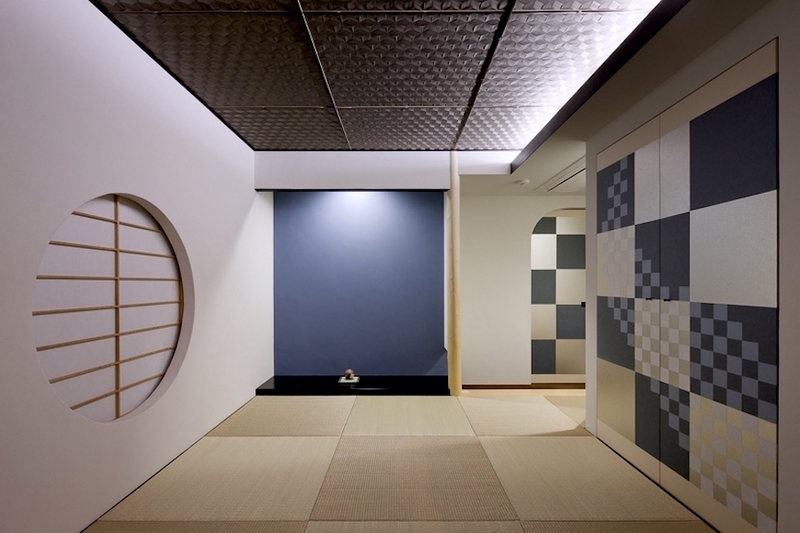 Japanese rooms are typically measured by the number of tatami mats that would cover the floor. The smaller than four and a half tatami mats houses are called “Koma” and larger ones are called “Hiroma”. 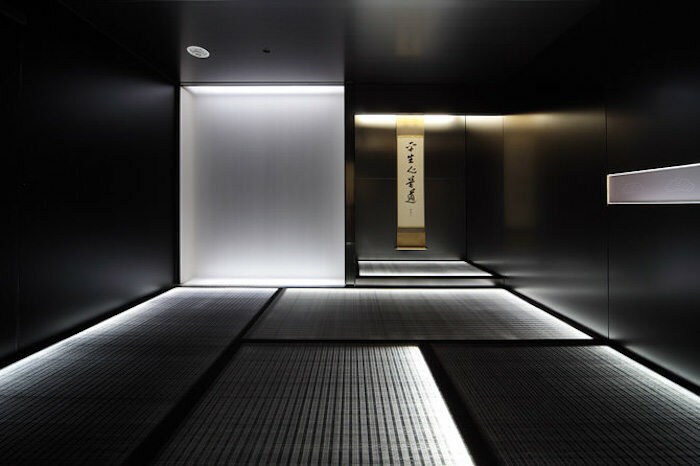 Each tatami has its own name and function. All doors and windows are traditional Japanese shoji, the sliding doors made of a wooden lattice covered by translucent Japanese paper which allows light from outside to filter into the room. This extraordinary small room was meant to create the space to share the deepest feelings between the host and the guests. The great variety of bamboo, wood, reed, vines, and straw suggests that such tea houses are created from materials found in nearby forest and fields. There is no furniture, except for that which is required for the preparation of tea. 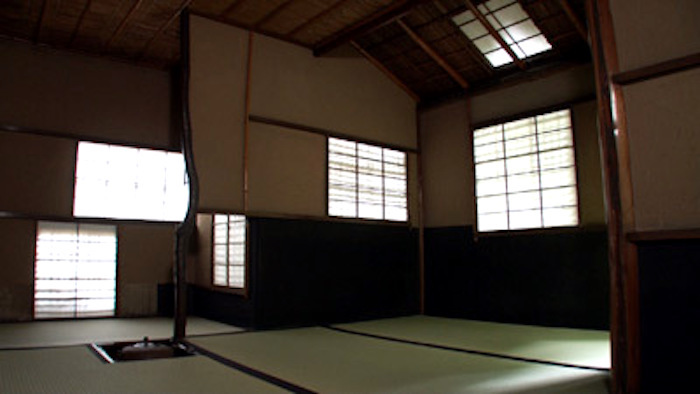 Usually, there will be a charcoal pit in the center of the room by cutting a piece of the tatami is used to boil water. From November to April, a hearth installed in the pit. From May to October, the hearth is covered back up with tatami and a portable stove called a furo is used instead. 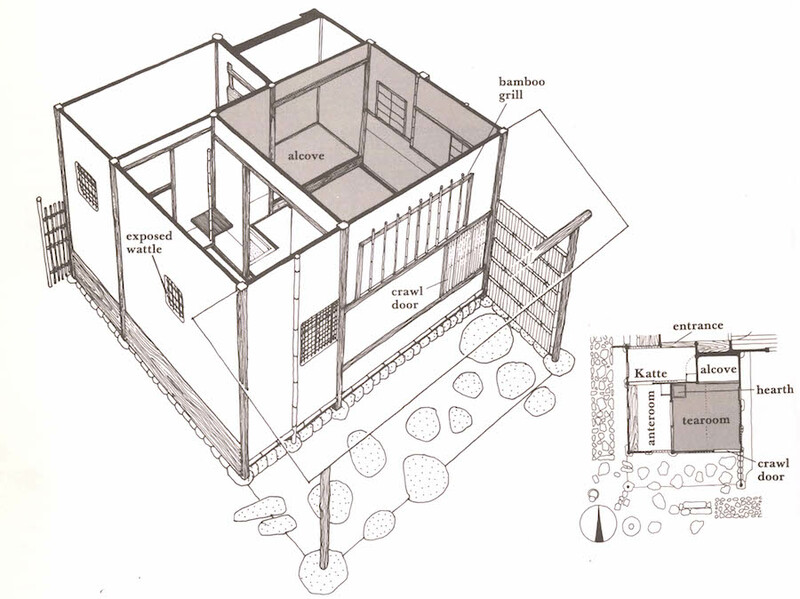 The alcove where decorated with a hanging scroll and flowers (cha-bana) is the essential part of the tea house design. When guests enter the tea house, they first proceed to the alcove to admire the decoration. 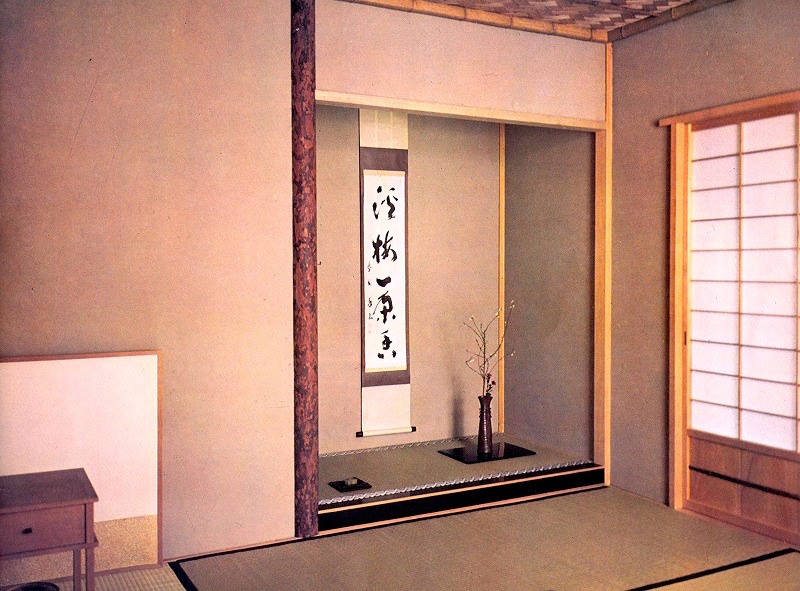 The wall of the alcove is plaster and the floor of the alcove may be wooden paneling or tatami. It is where you can feel the sense of connection with nature and its beauty. Originally, a hanging scroll is hung each day in the morning as one do so with a fresh feeling. This is where the host cleans utensils and makes preparations for a tea ceremony. 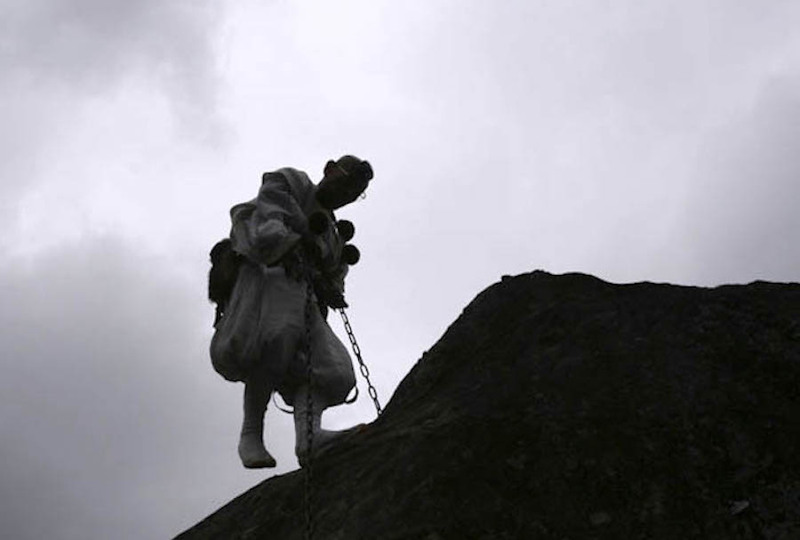 In 1187 Myoan Eisai, a Japanese priest, traveled to China to study philosophy and religion. When he returned to Japan, he became the founder of Zen Buddhism and built the first temple of the Rinzai sect. During the Muromachi period (1336-1573), Japanese architecture went through a transformation from the formal palatial style (Shinden-zukuri) to a simplified style (Shoin-zukuri) favored by samurai class. 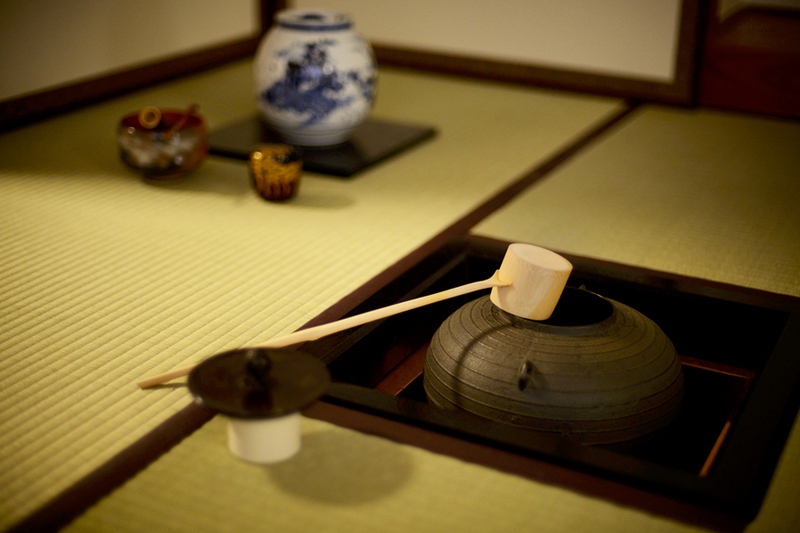 Murata Jukou, known as the father of the tea ceremony, developed the etiquette and spirit of tea. He studied under Ikkyu Soujun and practiced Zen meditation at Daitokuji Temple. Jukou preferred the intimate and personal atmosphere of a small room, which could fit five to six people when he served the tea to his guests. His goal was to transcend the complex distractions of the world and find enlightenment in everyday life. 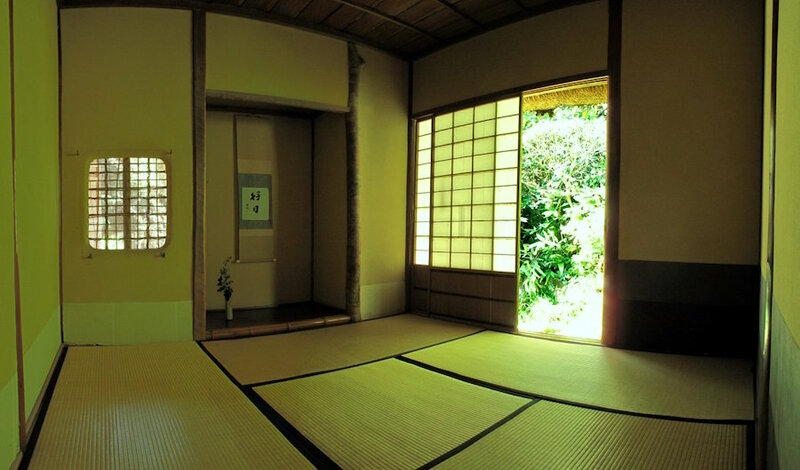 The four and a half tatami mat room that he had devised to create a more tranquil atmosphere during the tea ceremony had its origins in the Zen philosophy he had studied at Daitokuji Temple. For the tea ceremony, some of the Shoin-zukuri details were adopted such as the tokonoma alcove and the side-alcove desk which would lead the third style, Sukiya-zukuri which would produce more varieties of tea houses/rooms. In 1489, Ashikaga Yoshimasa, the Muromachi shogunate, built Ginkakuji (Temple of the Silver Pavilion) in Kyoto under the influence of Jukou. The small room in it kept the atmosphere intimate and the host and guests closely connected throughout the ceremony and some consider it as the oldest tea room. 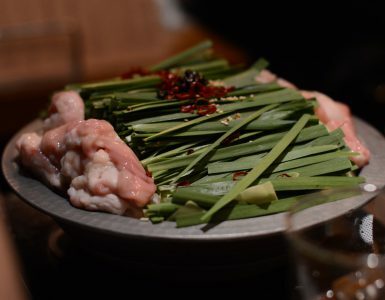 It was the Wabi-cha tradition that Rikyu perfected after Jukou in the latter half of the 16th century, solidifying the development of Chado. He completed the style by modeling thatched huts in mountain villages using simple and rustic materials intentionally. 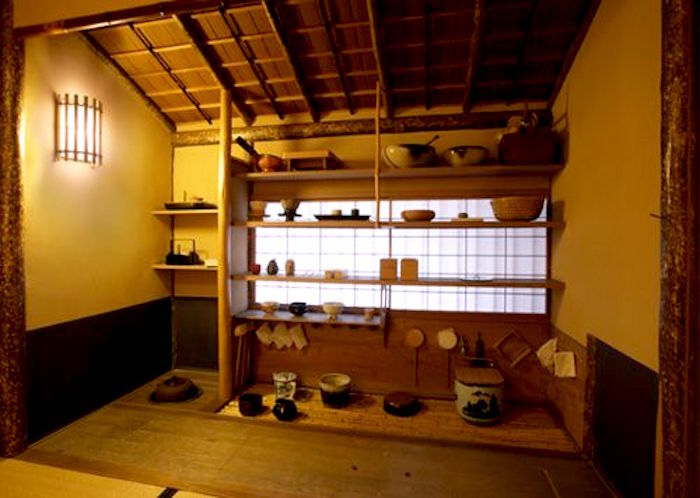 Extremely narrow tea room, smaller than traditional tea room size with four and a half tatami mats, three or even two tatami mats rooms were created by him. Typically, Soan tea houses are small with roughly cut or completely unmilled wooden timbers. Their rough, earthen walls are made by spreading a mixture of clay and straw over a bamboo lattice. In such a modest structures, seemingly far away from worldly concerns, tea can be enjoyed in a more meditative and philosophical way. Rikyu taught that this very quality of light was the life of the tea room. He intended to exclude anything to make his tea room a spot to experience the inner world. Having only a north window keeps the room darker, making utensils look greater and guests to look inwardly. Furuta Oribe, a successor of Rikyu developed the new tea room concept which resulted in a lot of windows designed to install purposefully to control the light. Unlike Rikyu, Oribe made the tea room where you can relax and enjoy the tea ceremony. Oribe’s tea room was like a stage where both the host and guests perform each role. Bold and free, his style is called “Bushi-cha” as well. The bright tea room had a gorgeous air, made the tea ceremony experience more festive. 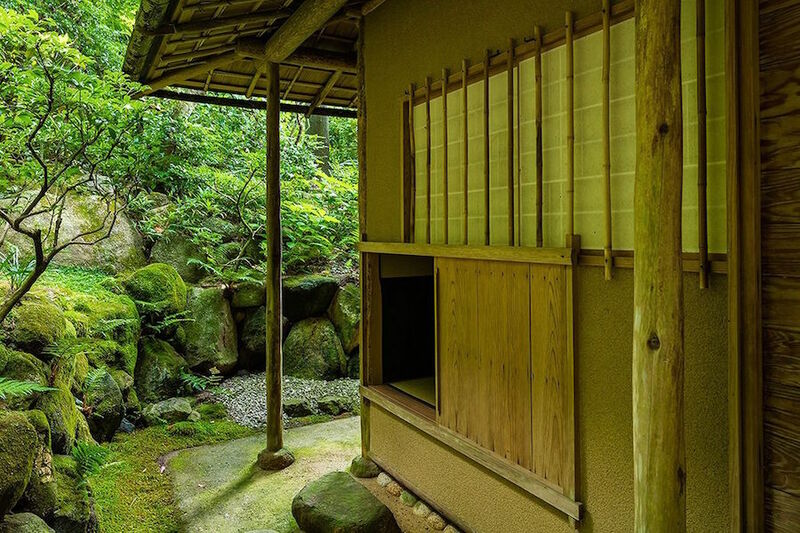 Modern architects strive to maintain the simplistic beauty of traditional tea houses, while also pushing modern interpretations of what a tea house can be. 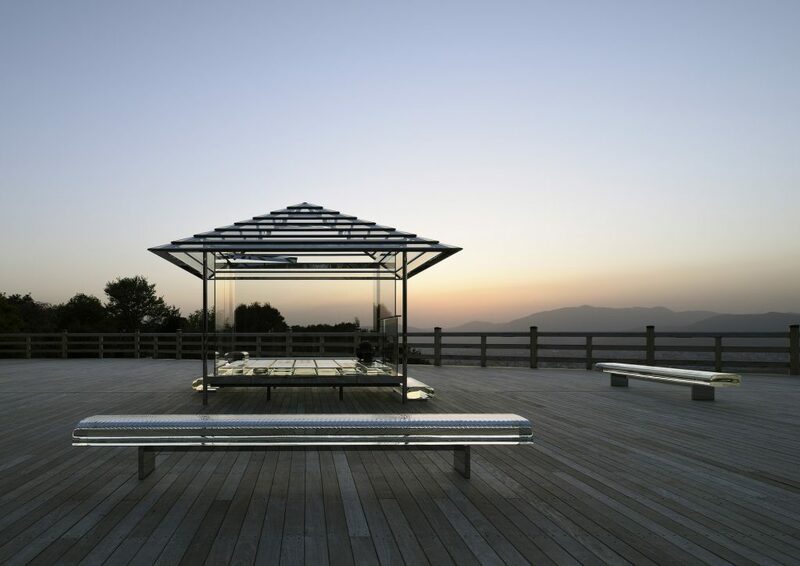 KOU-AN Glass Teahouse was installed at the stage of Seiryu-den, which is in a precinct of Tendai Sect Shoren-in Temple. Designed by Tokujin Yoshioka, this project originates in the architecture plan of the Transparent Japanese House, first presented in 2002. 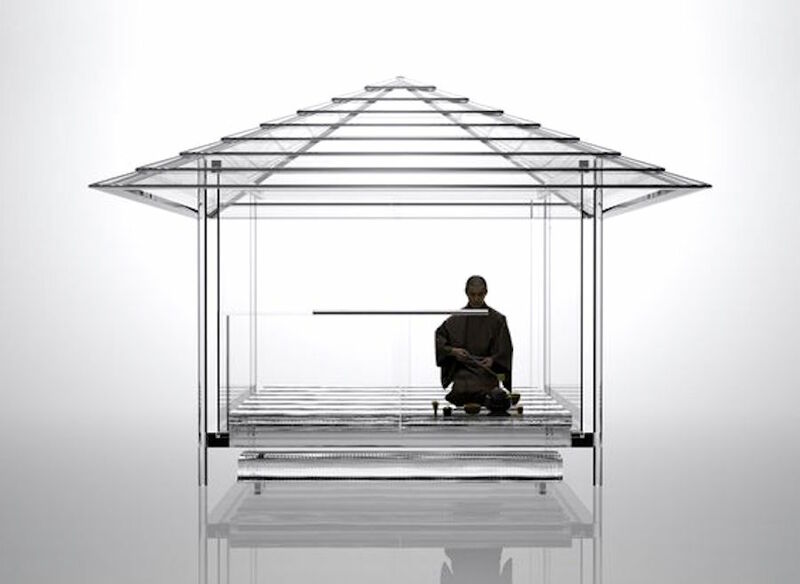 The idea has been developed into a transparent teahouse, an architectural project incorporating a symbolic Japanese cultural image. 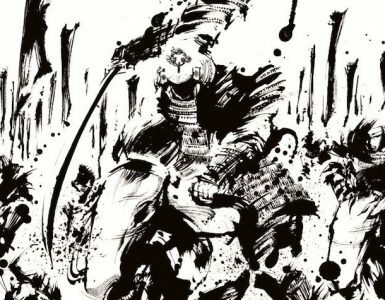 KOU-AN is the art-piece of tracing the origin of Japanese culture that exists in our unconscious sensation by perceiving the time that is created along with nature. It can be folded and reassembled again for the next tea ceremony. Shigeru says it is the typical Japanese ritual style, which enhances the time of now even more valuable by folding. Folded materials can be even more powerful while it’s stored in a storage, it’s believed they recharge the energy. Lights through the randomly weaved bamboos gives us a sense of openness. Still this tea house makes us feel we are in a special secluded place. 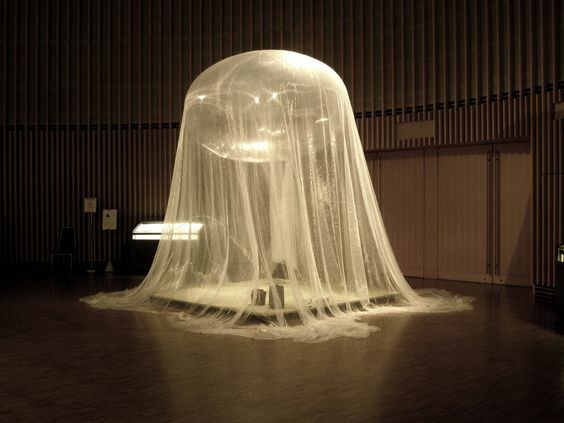 It’s made up of a helium balloon draped with an ultra-light material called super organza. 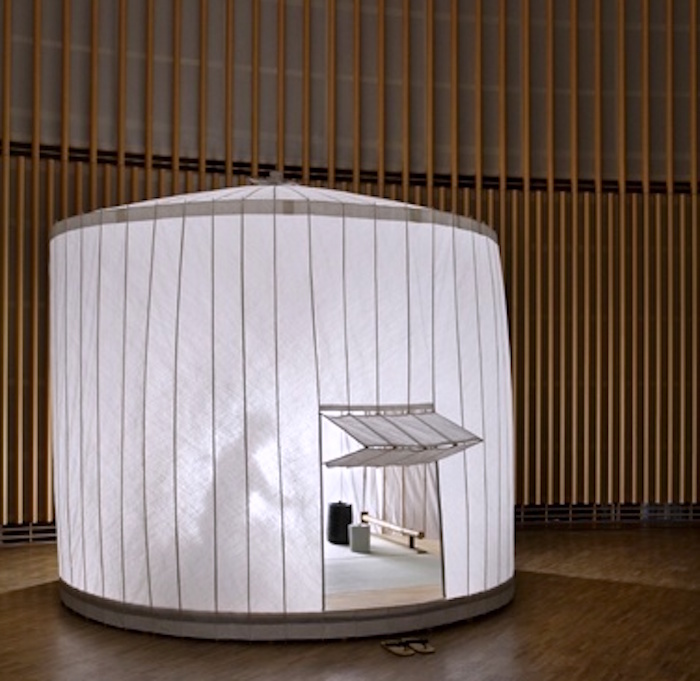 The fabric works with the pressure of the helium to create a floating structure without the use of walls or pillars. This absence of crucial building materials points to the simplicity of the structure and makes for the ultimate space of virtual reality. The architect Kengo Kuma talks about his creation, which was originally developed in 2007, as being a space of virtual reality where a state of consciousness in the form of a floating body can exist. It’s considered to be a remodel of Yu-in, which was a typical Rikyu’s style. All materials are painted black, which creates the subtle shadowy world. 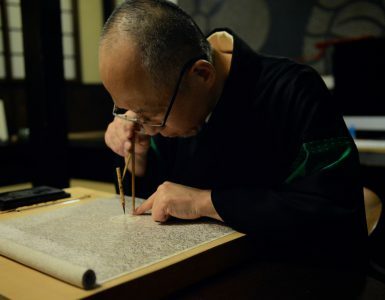 Shingo thinks it should be an insight for people who live in the modern day re-examine one’s own daily life by using familiar materials and techniques with this tea room. Fabricated from a single piece of bamboo, this prototypical structure is designed to house the ancient and highly prescribed rituals of the Japanese tea ceremony. Intended to be easily assembled and dismantled, it has its origins in the elegance, simplicity, and portability of the traditional oriental parasol.